Part of the legume family, lentils were one of the first domesticated crops in western Asia, around 10,000 years ago. Lentils have been around for so long that the word ‘lens’ in optics is actually derived from of the shape of the lentil. Canada and India are now the largest producers of lentils in the world. Lentils are often considered a superfood as they’re high in protein and fibre but low in fat. They also contain lots of B vitamins and magnesium and are recommended for people with diabetes or cardiovascular problems. As a slow release carbohydrate lentils will keep you feeling fuller for longer, so they make a good alternative to processed carbs such as bread and pasta. 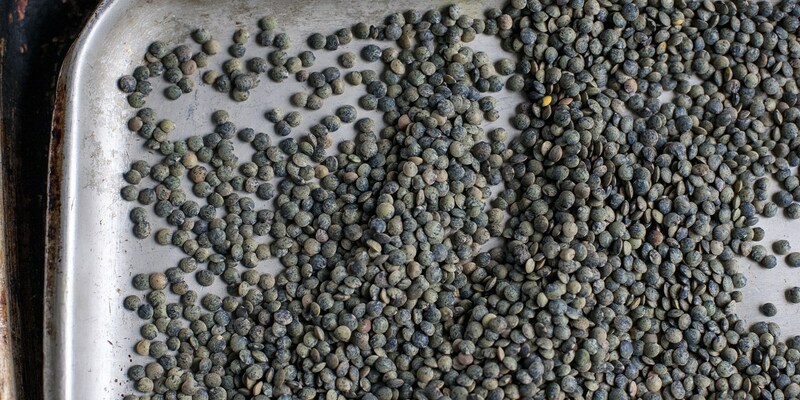 There are many different varieties and colours of lentils with the main types being brown, green, red and yellow. Red and yellow lentils have a short cooking time and are mostly associated with Indian cuisine. They’re commonly used in curries, especially dhal. Green and brown lentils take longer to cook and hold their shape better during the cooking process, which makes them more suited to salads. Puy lentils are a type of green lentil that have PDO status in the Le Puy en Velay area of France and are considered to have superior flavour due to the rich soil in which they are grown. All lentils should be kept in a cool dark place and used within a year. As lentils age, their cooking time will increase. Always rinse lentils before cooking. It’s also a good idea to sort through and eliminate any small stones or debris if they have been purchased loose. Although not completely necessary, the lentils will cook faster if soaked in cold water for a few hours before cooking. Salt and acid such as vinegar and lemon juice slow the cooking process of lentils by preventing them from breaking down, so be sure to only add these after cooking for best results. Red and yellow lentils will take around 30 minutes to cook in simmering water, while green and brown take slightly longer (around 45 minutes) to become tender. To check if the lentils are cooked, remove a couple from the water and check the texture. To impart more flavour, try cooking lentils in vegetable or chicken stock and adding carrots and celery to the pot. Lentils are great when used in curries, thickening the sauce and lending a nutty, earthy flavour. Alfred Prasad makes a traditional Yellow lentil curry and showcases lesser-used black lentils in his Dhal makhani. Dhal can also be used as part of a bigger dish; for example, Vineet Bhatia’s Grilled sea bass with okra and coconut rice is served with a creamy dhal sauce. For flavours from closer to home, try using lentils in stews and casseroles, Geoffrey Smeddle makes a simple but delicious Sausage and lentil casserole or for a real winter warmer try Graeme Taylor’s Ham hock and Lentil soup. Lentils are also a great addition to vegetarian dishes, providing valuable protein. Try these Green lentil, potato and mushroom burgers for a veggie main or Alfred Prasad’s easy to make Vegetarian kedgeree.